As stated on the slide, there was a hearing on September 12, 2018 in an appeal of the trial court’s decision. 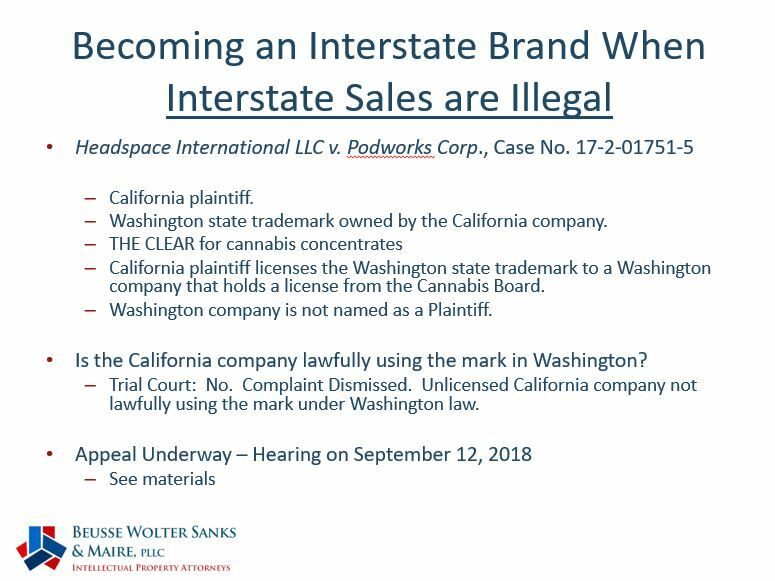 An appellate order was just issued today, and the appellate court overturned the trial court, holding that the California company did properly allege that it was using the mark lawfully in Washington despite not holding a Washington license to manufacture cannabis goods. Admittedly, this ruling is based on a motion to dismiss concerning pleading allegation technicalities, so its precedential value may not be too great, especially since Washington subsequently passed Senate Bill 5131 that allows licensees to enter into agreements for consulting services and licensing trademarks. I’ve written about Florida MMTC licensee Surterra and its branding in the past. Since that time, it looks like Surterra is no longer using MYAKKA GOLD, and, Surterra has recently announced a licensing deal with Jimmy Buffet and his Margaritaville empire. Of course, as readers of this blog know, the applicant, Coral Reefer, LLC, may have some trouble registering at least the Class 5 and Class 10 goods depending on the luck-of-the-draw with the USPTO Examining Attorney. In any event, this may be the first “celebrity brand” license deal for cannabis in Florida, joining the likes of Snoop Dogg, Willie Nelson, Merle Haggard, and Bob Marley, each of whom has licensed cannabis products in other states. 1) The applications were assigned after being filed, which is a little unusual/risky for intent-to-use applications depending on who the assignee is and its relationship to the assignor. Fortunately, language in the assignment, which you can see HERE, suggests that the risk might not be present in this case because the assignment claims that Coral Reefer, LLC, as assignee, is the owner of an ongoing and existing business and successor of the assignor. 2) In reviewing the assignment, not only did Margaritaville Enterprises assign the CORAL REEFER marks to Coral Reefer, LLC, but it also assigned a bunch of “IT’S 4:20 SOMEWHERE” marks, which were also filed on May 3, 2018 for similar goods and services. A subsidiary of Florida MMTC licensee AltMed Florida is Nutrae, LLC, which offers the “MüV” brand of products. Click HERE for application paperwork. Cannabis Patents – The Elephant in the Room? I write a lot about trademark issues within the cannabis industry, but there is another aspect of intellectual property that I believe will have a greater impact on the industry than even brand/trademark disputes, and that is patent infringement. Cannabis-related patents have been around for years, but we’re just starting to see those patents being challenged and asserted. Two recent examples are illustrative of what I believe will become more and more commonplace in the very near future. Case 1: Insys Development Co. v. GW Pharma Ltd. This case is actually an “inter partes review” (or “IPR”) before the United States Patent and Trademark Office’s Patent Trial and Appeal Board (“PTAB”). In a nutshell, the IPR process allows a party to challenge the validity of another party’s patent prior to any claims of infringement. The argument is that the patent never should have been issued because the invention was already known or was obvious before the application was filed. A method of treating partial seizure comprising administering cannabidiol (CBD), to a patient wherein the CBD is present in an amount which provides a daily dose of at least 400 mg. Thus, if your CBD product is used to treat partial seizures and the treatment method includes CBD “in an amount which provides a daily does of at least 400mg” then you arguably infringe the patent. Insys filed an IPR petition to cancel the ‘920 Patent based on “prior art” (i.e. relevant evidence) which Insys believes shows that the invention in the patent was already known or was otherwise “obvious” in light of other prior art that existed prior to the filing of GW Pharma’s application. The IPR process (and patent law in general) is very complex and beyond the scope of this post, but for a very detailed and thorough treatment of the IPR process and this specific Insys v. GW Pharma case, check out this post, which is where I first learned of the matter. It was, and still is, one of the few outlets discussing the Insys IPR. One reason this IPR is so important is because the claims in the patent are fairly broad and could implicate many, many products that are already being marketed (albeit perhaps without the claims of treating epilepsy and seizures, which is part of what complicates these cannabis-patent issues). So, just how easy is it to challenge a patent like this via an IPR? Well, you’ll need over $30,000 just in filing fees to the USPTO if your petition is accepted by the USPTO and the proceeding is instituted ($15,000 just to file the petition, and another $15,500 if the USPTO “takes the case” and starts the review process). You read that correctly – over $30,000 just in government filing fees to get started. That does not include the attorneys’ fees that Insys (and GW Pharma) are paying, which I conservatively estimate are already in the hundreds of thousands of dollars. This is all to invalidate a single cannabis-related patent. Below are some links to key documents in the IPR. This is complicated litigation that few businesses can afford despite the fact that some of these patents affect the very ability of such businesses to exist. Sample deposition transcript to show the type of testimony involved when seeking to invalidate a patent. There are many supplemental procedural issues involved in this case, but I expect a decision regarding the ‘920 Patent’s validity will be reached within the next couple of months. Case 2: United Cannabis Corporation v. Pure Hemp Collective, Inc. This case is different than the above IPR because this is a “classic” patent infringement case that is being brought within the United States District Court for the District of Colorado. Whereas Insys brought an IPR at the USPTO to try and invalidate GW Pharma’s patent prior to GW Pharma asserting the patent against Insys, here, United Cannabis Corporation owns a patent and is alleging that Pure Hemp Collective’s products infringe the patent. The similarity to the IPR is that it is typical practice for the defendant in a patent infringement case to defend against the infringement by counterclaiming that the patent is invalid. Thus, the Colorado court will likely address the validity of the patent should the case proceed. A liquid cannabinoid formulation, wherein at least 95% of the total cannabinoids is tetrahydrocannabinolic acid (THCa). The case was just filed on Monday of this week, so it’s too early to see how Pure Hemp Collective intends to respond, but I’ve linked to the Complaint and patent below. 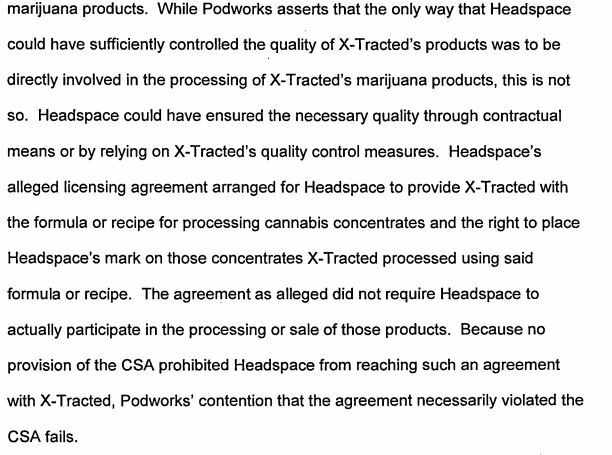 It is much easier reading than the above IPR documents, and it is a pretty typical example of the type of patent infringement complaint I predict we will see more and more of in the very near future as cannabis-patent owners start asserting their patents. In sum, I expect to see more patent friction within the cannabis industry, and I also expect the media attention to increase as the gravity of cannabis-related patents becomes more well-known. There are already “patent busting” projects out there related to cannabis-patents, and I would not be surprised to see an increased focus on those efforts. Another Florida State trademark registration was issued, this time to MMTC license-holder DFMMJ Investments, LLC, d/b/a Liberty Health Sciences Florida, LLC (affiliated with Aphria brand). Click HERE for the application paperwork. Looking forward to presenting on trademark law and cannabis-related trademarks again at the upcoming “The Business of Marijuana” CLE in Miami October 2-3, 2018. I spoke at this seminar last year and really enjoyed the other presentations. This year, it looks like there is much more local flavor, including a Florida-based chair and potential participation by several Florida licensees. Should be even better than last year. My presentation will include a bigger focus on Florida trademark issues. This probably comes as no surprise given how much of the blog has been devoted to that issue lately. Federal vs. State Law, Supremacy Clause, Conflict principles, and the Commerce Clause; Analysis of memoranda from Department of Justice regarding treatment of states with “robust” cannabis regulations; Nebraska and Oklahoma v. Colorado; Federal enforcement of Controlled Substances Act and what this means for marijuana businesses. Update on the status of implementation of Amendment 2; Registration of patients and caregivers; Registration of Medical Marijuana Treatment Centers; Status of regulations – edibles, testing, and dosing; Update on recent litigation. Analysis of IRC Sec. 280E; Case law; Audits; State tax considerations; New trends; Corporate structures and strategies. Analysis and compilation of a cannabis lease agreement; Purchase and sale agreements for land to be used for marijuana businesses; Specific leasehold issues; Broker liability; Due diligence; Escape clauses; Zoning and other land use requirements; Landlord liability for changes in local land use law. What are “Marijuana Trademarks”? How do marijuana trademark marks differ from other trademarks? What to consider when choosing a marijuana trademark? Federal vs. State trademark registrations; Other brand protection mechanisms; Due diligence and actual registration; IP licensing and controversy. How will the State of Florida deal with the tensions between federal banking laws and the passage of Amendment 2? An explanation of federal Anti-Money Laundering laws and analysis of 2014 Department of Treasury guidelines; What steps financial institutions must take to follow those guidelines in order to bank Florida’s medical marijuana industry; Is bank financing possible? What will it take to get banks to do business in the cannabis industry? What kind of due diligence should a financial institution undertake with marijuana entrepreneurs? What advice should attorneys give to clients about the banking “epidemic”? How to raise money in Florida’s medical marijuana industry? Can entrepreneurs even raise funds under the current Amendment 2 regulatory rules? If they can, how do they do that? What should a solid medical marijuana PPM contain? What should the “Disclaimer” section disclose? What liability exists for investors? What kinds of questions should investors be asking? How should an investment deal be structured in the medical marijuana industry? Is that deal the same in every state? Are Kickstarter or other crowd funding sources possible for the medical marijuana industry? If not, why not? How should attorneys navigate representation of cannabis businesses? Does the federal conflict matter for attorneys practicing in this area in marijuana-friendly states? What is the difference between “assist” and “advise”? Analysis of Bar opinions from various states, including Colorado, Washington, and Alaska post-legalization; Group discussion on the ethics of advising clients; Taking an interest in the business of a cannabis client; Attorney ownership or participation. Standards for physician qualification and Medical Directors; Qualifying Medical Conditions and the process of registering a patient; Conflicts of interest; Issues for physicians relative to their traditional practices; obtaining professional liability insurance; How does one become a caregiver and what are the duties and responsibilities in doing so; potential exposure and liability for physicians and caregivers? MMTC inspections and administrative actions. A discussion of legal issues to consider when contracting with marijuana related businesses with a focus on the general legality/enforceability of such contracts under Florida law, risks associated with secured transactions for borrower and lender, bankruptcy and insolvency issues, provisions for shifting regulatory and legislative risks, dispute resolution options, choice of law provisions, issues specific to commercial leases and other general contract law considerations. Types of insurance needed by cannabis businesses: General Liability, E&O/Professional Liability, Casualty Coverage and Business Disruption Coverage; Are these coverages written for cannabis businesses by the big national carriers? If not, why, and where can you obtain these coverages? Expected coverage disputes and how to avoid them. Industry issues and perspectives from actual licensee applicants and ancillary businesses; Relationships between licensees, including logistics and dynamics of contracting for goods and services; Regulatory compliance priorities; Navigating state agencies as a licensee. Yesterday I wrote about the “legend” of MYAKKA GOLD and how old brands can unexpectedly reappear. Today, I learned that another Floridian has reached back to claim rights to yet another “legendary” brand. This time, it’s CRIPPY. Yes, that “crippy.” The “crippy” that the highly-respected Urban Dictionary has defined as “High quality grade Marijuana, usually from Florida.” The “Crippy” that Pitbull described in his 2007 “Sticky Icky” treatise as “I need that sticky icky, that Miami crippy; That Washington high purple, watch out that thang will hurt you.” No matter your definition source, “crippy” has for years been considered a “Florida thing” – sometimes as a synonym for “dank” cannabis and sometimes as the name of a specific strain, but in both instances, it’s something originating in Florida. Since this post is focused on CRIPPY, let’s look at that registration. It indicates that the mark was first used with a “unique medical cannabis variety” on December 13, 2013. Why is that date important? Well, it establishes the priority date for the trademark owner so that if anyone was selling similar goods with a similar name prior to that date, they would have senior rights. Florida’s low-THC “Charlotte’s Web” law wasn’t even on the books in 2013, so I am not clear on how the CRIPPY applicant actually used the mark in commerce in 2013. At the federal level, a “use in commerce” must be a lawful use (thus the current inability to register many cannabis marks via the United States Patent and Trademark Office). See, e.g., FN Herstal SA v. Clyde Armory Inc., 838 F.3d 1071, 1086-88 (11th Cir. 2016) (discussing lawful use requirement for federal registration). So, would a 2013 sale of CRIPPY in Florida be a lawful use? Does Florida’s trademark statute even have a lawful use requirement? Was there a medical cannabis variety in Florida named CRIPPY in 2013? Those answers are very relevant to the viability and enforceability of these registrations. I know nothing about this applicant, and there may very well be some factual scenario that makes these registrations perfectly legitimate. However, from a high-level view, CRIPPY, and perhaps others in the list, have been known cannabis strains since well before 2013. 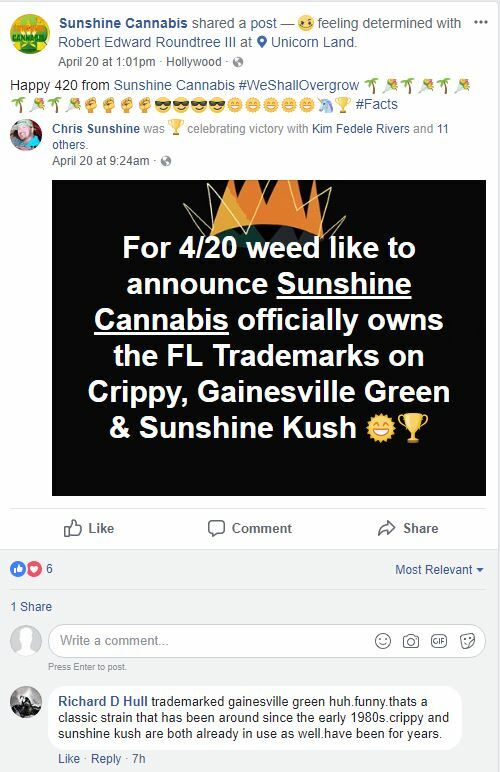 Does that mean someone can’t or shouldn’t try to claim rights to them now that cannabis is a good which can be legally bought and sold in Florida under certain circumstances? Those are tough questions, but trademark registrations are not like amassing domain name registrations where entrepreneurs register domain names for the hope of subsequent sale or use one day. I am not suggesting that this registrant is treating trademarks as such – I’m just using domains as an example of an “IP-ish” asset that can be dormant and still have value. In Florida, to receive a trademark registration, you must be offering the goods or services for sale under the mark before you obtain a registration. There is no “intent to use” path like there is at the federal level. Was this cannabis strain being lawfully sold in Florida in 2013? I don’t know. Regardless, if a licensee or anyone else who might be authorized to sell branded cannabis has the ability, or even the right, to re-purpose legendary strain names into single source-identifying brand names (which is what trademarks do – identify a single source for goods or services), should they? Is your buddy from college who used to sell you CRIPPY in the 1990’s going to challenge this trademark registration? Of course not, but it shows the mess that is slowly building despite the tightly-controlled vertical-integration model Florida has established. So, what is the Florida-based medical marijuana entrepreneur to do? State trademark registrations are an option, but Florida does not recognize “intent to use” applications like the USPTO does. This means that even if you are planning to open a dispensary, nursery, or other marijuana-related establishment once the regulations are drafted and licenses are issued, you cannot apply for the state trademark registration now because you cannot yet legally run a medical marijuana facility in Florida. The flood of state applications that will occur on Day 1 will be astounding, and anyone who has used Florida’s state registration system knows that this impending flood just might break the system. While the system might not have broken yet, I do think that we are headed toward increased brand (and registration) tension because of registrations like these, and it’s unclear at this stage if the law, the market, or both will need to step in for a correction. BONUS CONTENT: I posted that this applicant received state trademark registrations, so why didn’t I use the “circle-R” registered trademark symbol in the title of this post, instead using the “TM” symbol after CRIPPY™? Because only owners of federal trademark registrations can use the circle-R symbol. State registrants are still limited to the “TM” or “SM” symbols, which typically identify “common law” uses when dealing with federal marks.